This is a good alternative to inflatable floating aids. Microcell paddle float is always ready to use and also offers good flotation. The Microcell upper slab is curved to be more versatile: you can place it under your knees and relax your legs during long trips on the water or use it as a camp seat. 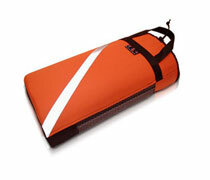 200-denier nylon cover with 3M reflective tape on top of the paddle float.